The aim of the EPC II project is to compare the clinical status of patients who have undergone an Epiduroscopy procedure, upon compliance with indicated study criteria. EuroPainClinics® Study II (EPCS II) objectifies the benefits of the minimally invasive pain management procedure, Epiduroscopy, on patients with back pain after one or more unsuccessful spine surgeries with failed back surgery syndrome (FBSS). It is focused on pursuing long-term pain relief and improved quality of life in these patients. EPCS 2 Approval document The project meets all the attributes and valid legislative standards relating to medical procedures as approved by the Ministry of Health of the Slovak Republic and the Czech Republic. EuroPainClinics® Study II® (EPCS II) objectifies the benefits of the minimally invasive pain management procedure Epiduroscopy. 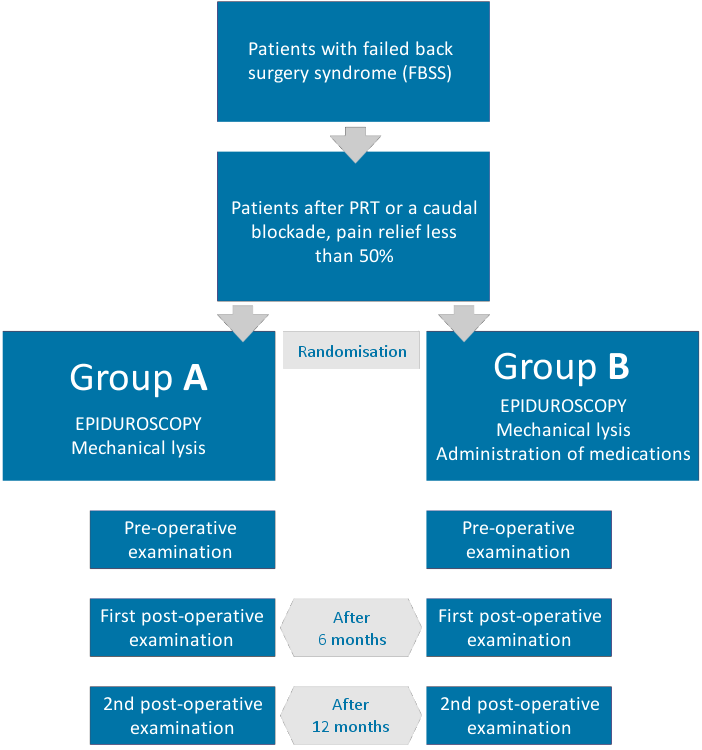 The topic of the project is the implementation of a multicentre prospective double-blind randomized clinical trial comparing two methodologies of performing Epiduroscopy in patients with FBSS. It was approved on April 23rd 2015 by the regional hospital ethics committee (reference number EK: 75/EK/15), following the design of the study and preparation of informed consent for study participants, as well as the study protocol. It was subsequently registered in the U.S. National Institutes of Health international database https://clinicaltrials.gov PRS: NCT02459392. The project meets all aspects and valid legislative standards relating to medical procedures as approved by the Ministry of Health of the Slovak Republic and the Czech Republic. The processing of personal data of patients in order to conduct the study is in accordance with the current version of the 2008 Helsinki Declaration and in accordance with the applicable laws of the country. Patient privacy will be guaranteed. The data will be handled in accordance with EU directives: Directive 95/46/EC, Directive 2002/58/EC, Directive 2006/24/EC. It will be ensured that the study protocol, informed consents, and the inclusion in the ongoing study, are provided to the appropriate independent ethics committee in accordance with local requirements. In the event that the laws of the country require so, EuroPainClinics R.I. is responsible for providing annual updates of the documentation to an independent ethics committee. Results obtained in the study will be published in international scientific journals and taken into account in the recommendations and practices of clinical interventional pain management. The aim of the study is to compare two groups of patients who will undergo Epiduroscopy. Patients in Group A will undergo lysis of fibrous adhesion, while those in Group B will undergo lysis of adhesions as well as administration of the corticosteroid Depo-medrol and hyalase. During adhesiolysis, the physician removes adhesions on the affected nerve or dura under visual guidance. Adhesions may be removed mechanically (with the use of the tip of the visually guided epiduroscope), or by pressure rinsing with saline. Advanced methods of the mechanical removal of adhesions include lysis using laser and pulsed radiofrequency ablation. Topical drugs administered into the epidural space during the procedure and their predicted effect: Hyalase may contribute to the removal of adhesions through enzymatic cleavage. In the case of Depo-medrol, the mechanisms of action are considered to be its anti-inflammatory effect at the site of administration and the subsequent tendency of reduction in the inflammatory response, cell migration, swelling, pain and adhesion. Despite these theoretical effects of these drugs, their benefits in the results of published studies have not yet been verified and therefore their administration is considered questionable. The aim of the project is to compare the clinical status of patients who underwent the Epiduroscopic procedure and were enrolled in EPC Study II, upon compliance with indicated criteria. The outcome measures will be the clinical condition, visual pain scale (VAS), global pain scores, spreading of pain in the corresponding dermatomes, reduction in the use of analgesics, and the Oswestry Disability Index (ODI – indicating the quality of life in patients with lumbosacral spine pain). The observed parameters will be recorded in three time periods, namely: before the procedure (First Examination), followed by 6 months after the procedure (Second Examination), and finally 12 months after the procedure (Third Examination). The results will then be subjected to statistical analysis. A further aim of the project is the publication of its findings in international scientific journals.